Iteration three! In play-testing, it started feeling and playing like a lockdown control deck, and that's not the derection I wanted to go for with this build. Still very actively working on and changing this project, so advice and suggestions are both welcome and requested. The strategy of the deck is to try and stay mostly under the radar. Dishing out hugs and help through mass table-wide draw and ramp spells and abilities, to distract them long enough for me to get in an explosive turn, and maybe even a win. My win-cons revolve around opening an avenue for Roon of the Hidden Realm and the 'Hug Army' to swing to face. Be it through Dramatic Reversal on Isochron Scepter or Illusionist's Bracers on Tidewater Minion . They both end in infinite bouncing. paired with Mirari's Wake and Collective Blessing to boost my field, and cut down on the turns it takes once I go off and have the lockdown in effect. In more than a few games, I've ended up with an excess of life, because of Trostani, Selesnya's Voice and Panharmonicon How better to use my life total, than to laserbeam people in the face with Atherflux Reservoir, right? So, the main pieces of distraction tech: Otherworld Atlas Dictate of Kruphix Horn of Greed Ghirapur Orrery and Collective Voyage . Draw and Ramp galore for everyone. It's all well and good to be the nice guy at the table and help people at the table, by keeping hands full or even over full. But how do I protect myself if the distractions don't work? 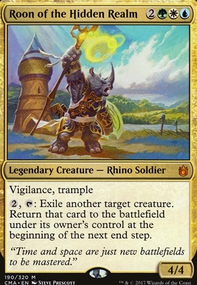 Bouncing key parts of opponent's boards into Authority of the Consuls for starters, Or using Mangara of Corondor in association with Roon or Justiciar's Portal on the Isochron Scepter to remove any given permanent, without losing Mangara. If that doen't work, the deck has 10 fog effects, and a few ways to bring them back over and over again, through Archaeomancer and Eternal Witness . Time for the toolbox section! I use a little pack of artifacts in nearly all my decks. I call it the shenanigans package, it contains: Strionic Resonator Mirage Mirror and Rings of Brighthearth . 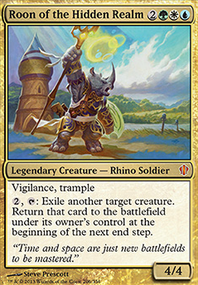 They're so versatile in nearly any given situation, from copying Roon to bounce a second creature, to getting extra ETB effect value. Why wouldn't you want to use one effect up to 5 times in a given turn? Build up atlas faster? Rings can do that. Peregrine drake coming back, and you need more mana? Strionic can double up on the untappy shenanigans. Mirage mirror is only a part of it because it can be absolutely anything you need on any given turn.